We put some great prizes on the table for our US30 contest participants and they are now officially shipped to the winners! 35 school clubs racked up points on the leader board from Universities across the US. The Columbia, Kellogg and UC Berkeley Clubs finished #1, #2 and #3 to claim our Top 3 Clubs prize. Berkeley held the top slot at the start but ceded to Kellogg and Columbia in the last week. As our Top 3 finalists, each US30 player in the Columbia, Kellogg and Berkeley clubs was awarded $25 Flat-Club Travel Money. Our individual US30 $500 Lottery winner was Raymond of UC Berkeley! Additionally, as the UC Berkeley Club was a Top 3 finalist, Raymond scored $525 in Flat-Club travel money for the holidays. The third and final winner is yet to be announced. The application for our US30 Great Marketing Internship is open through the end of 2012 and we look forward to bringing on a great candidate in early 2013! The US30 was great fun and we all win with a bigger student/alumni accommodations community, new places on the map and new clubs to expand. 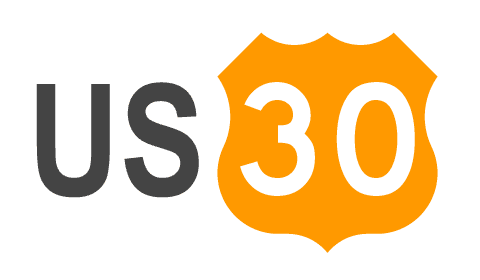 Thank you to all the participants, volunteers and supporters of the US30 and Happy Holidays to all! Join your club today and start reaping the benefits of club membership: discounts, exclusive flats, and more. Flat-Club’s spent its first year with the LBS Incubator Programme which was invaluable. Support from the Incubator was critical to building our first working relationships with top tier universities, attracting our first customers and establishing credibility in the eyes of students, faculty, staff and alumni who we are building Flat-Club for. Year 2 has been a rollercoaster. 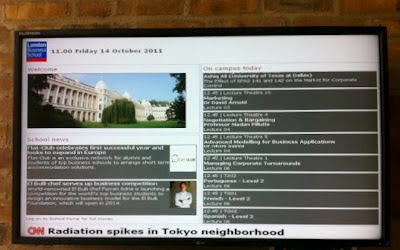 Kicking off 2012 we were selected #1 in the TechCrunch One Sentence Pitch Competition in January. Though a small competition for TechCrunch, it boosted our profile and confidence that Flat-Club’s model of renting within trusted networks had mileage. 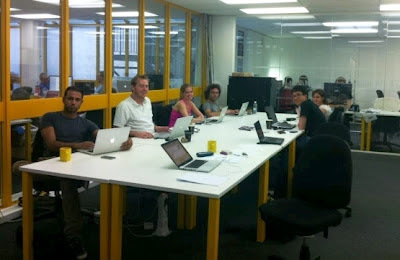 Through spring and summer of 2012 we raised our first round, grew the team and moved to Google TechHub London at the Old Street roundabout. It has been very exciting sharing space with other cutting edge start-ups and having access to the ecosystem resources for contacts and advisement. In late fall this year we made our first major push into the US Market launching Flat-Club in over 30 top universities and business schools in America; our US30 campaign. We’re proud to have earned the attention of great press during the year and find it extremely rewarding to see prestigious publications such as The Guardian, Forbes, and the Financial Times cover pieces of the Flat-Club story. We are celebrating Flat-Club’s second birthday inspired by the team’s accomplishments and even more excited about where we’re headed for 2013. So to celebrate turning 2 we want to express an enormous thank you to all of our advisors, partners, friends, staff and most importantly – customers. Our team is passionate about bringing the benefits of Flat-Club to the students, alumni, faculty and staff of many more top universities to come. Search for your club and join today! Flat-Club Launches In The US! Flat-Club is officially launching in America - today! The campaign, called the US30, will introduce Flat-Club into over 30 top universities and business schools in the USA all in one go. Over the last eighteen months, word-of-mouth has taken the Flat-Club platform through University communities in Europe. We’ve grown from 5 apartments at London Business School to 3,000 accommodations with 50+ school clubs across Europe. Not only has Flat-Club’s European platform expanded so quickly, we’ve also earned some great coverage from the Guardian, Forbes, Financial Times,as well as winning the TechCrunch 2012 One Sentence Pitch Competition and being awarded a place in the top 16 start-up companies in Europe at the Pioneers Festival in Vienna. It’s been a great year and a half and we’re closing 2012 with a big move into America. We’ve enlisted the help of 56 Launch Ambassadors - university students or alumni at our target US schools, to help with the launch. They are the friends and friends of friends of Flat-Club’s team and customers and all excited about bringing the platform to their school community. We are kicking off the campaign by opening a competition between the schools on our dedicated US30 page. Students, alumni, faculty and staff can earn points by for their club in 3 ways. The top 3 clubs with the most points by the end of the competition win $25 travel credit for every member and there are also prizes for individuals. Those students and alumni who earn enough points will get entered into the Flat-Club Lottery for a mega prize of $500 travel credit and they can unlock the application to One Great Marketing Internship. Our selected candidate will become Flat-Club’s first International Social Media Correspondent and will be in charge of running a marketing campaign to tell the Flat-Club story – from the road. We’re providing the Intern with a new iPhone5 World Phone (that they keep), $1,000 to spend on accommodation and flight tickets and a lot of freedom to put creative ideas to work. ith the US30 we’re taking the Flat-Club concept to the US and continuing to solve one problem. As CEO and Founder Nitzan Yudan puts it “we provide alternatives to hotels, hostels, service apartments and short term rental marketplaces by solving the biggest problem of peer to peer renting – trust.” Rather than inventing a new way to build trust between members, Flat-Club simply goes to where it already exists, like university student and alumni networks, and leverages it to create a great short-term renting marketplace. Help us spread the message across America, join your US University club and grow it now! OK, so Christmas does feel quite far off. At FlatClub we’re in total agreement with you that it's certainly too early to start dusting off your decorations, putting up your trees or selecting festive gifts. However, it is not too premature to start thinking about Christmas bookings. Our experience has shown that posting your room/flat in advance significantly increases your chances of securing a booking. Are you planning a trip away over the festive period? Will your room or flat be free? Then post it on FlatClub! Even if you are just away from home for a week, visiting relatives or taking a Christmas vacation, you could still be earning substantial money. With all the presents, food, drink and celebration, Christmas is never the cheapest time of year. However, through making the most of your home when you’re not there, you could earn quite a substantial amount of extra money, helping to ease the pressure off that festive overspending! Have you thought about renting a place through FlatClub? It is widely accepted that comfort is one of the key criteria for making a good Christmas. Whether that comfort comes in the form of food, friends or a warm drink in front of the fire, feeling comfortable is integral to enjoying the festive season. This is why renting accommodation through FlatClub is the ideal solution for a Christmas getaway. At FlatClub, we pride ourselves on the fact that rooms and flats are shared between real people. Therefore, when renting a place through FlatClub, you can always feel assured that your chosen accommodation will feel warm, inviting and offer all sorts of home comforts – perfect for Christmas! 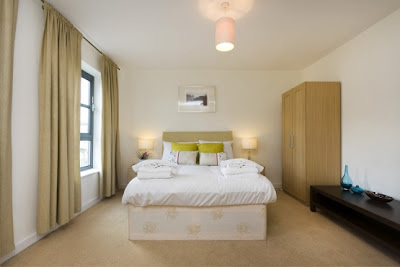 We already have a great selection of fantastic rooms and flats available for the Christmas period, in all sorts of exciting locations and to suit a range of budgets. Booking early will avoid disappointment and ensure that you can start to look forward to spending your festive break exploring your chosen city whilst staying in your ideal accommodation. Use our Expert Search to find the best accommodation for you -- for free! Flat-Club Offers You $100 For Referring A Friend! At Flat-Club, we’re all very excited about the launch of our new referral programme. Our Refer-A-Friend scheme not only gives you the opportunity to gain $100 of travel money but it is also very much in line with the core values of Flat-Club; bringing together friends and friends of friends on our website to post their places for free and meet each other’s accommodation needs. We want to encourage our guests and hosts to invite their friends to our website: why? We are passionate about connecting together real people around the world to share their rooms or flats with each other. We want to expand the community of trust that Flat-Club is founded upon. Already, we are focused on leveraging trust from academic, professional or social networks, such as students and alumni from top universities. We now want to branch out even further and make the most of the trust that exists in friendship circles, encouraging friends to rent with confidence from their friends or friends-of-friends exclusively through Flat-Club. So, what are the benefits for you? Our Refer-A-Friend programme is a great way for both existing and new hosts to earn a substantial amount of money. If you invite a friend to Flat-Club and they post their room/apartment on our website, you will immediately earn $25 in travel money. Once your friend receives a booking, you will then have the choice between gaining an extra $75 or a $50 Amazon Voucher. Therefore, by simply referring your friends, you could soon be enjoying a stay in luxurious accommodation around the world for free! For the new host, Flat-Club provides another great opportunity to earn money. Through posting their room or flat for free, the new host can make the most of his home when he’s away and often gain enough extra income to pay for his accommodation abroad. Through Refer-A-Friend, you could also gain exclusive access to Flat-Club’s club community. One of the primary ways in which Flat-Club creates a sense of trust is through club membership. We have a range of clubs for different top universities, business schools and companies throughout the world for example Wharton, ESCP and London Business School. Students, alumni and staff can join their club and rent out their place exclusively to their colleagues or classmates from their same academic or professional network. Club membership makes a host appear more trustworthy, causing their flat posting to rank higher in search lists and gives them the opportunity to view a greater range of exclusive rooms/flats to rent. Through our Refer-A-Friend programme, Flat-Club guests and hosts can invite their friends to become a member of their specific club and therefore share the benefits that being a part of that club offers. As part of our program to help you when relocating to a new city, we are launching today a relocation guide to Barcelona, written by the people who moved and lived there. Ensure to have all the required paperwork to obtain the necessary Número de Identificación de Extranjeros (NIE). Brush up on your everyday Spanish phrases – although many people in Barcelona can speak English, it’s not guaranteed! 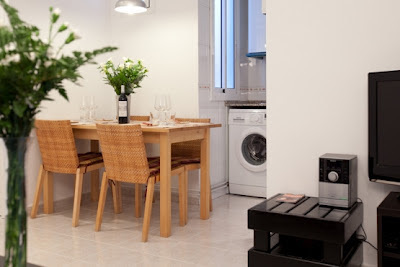 It’s a good idea to arrange short-term accommodation in advance for your first few weeks in Barcelona. This way you’ll have lots of time to look around for more long-term housing, ensuring that you’re really happy with your chosen place to live. Give yourself time to look around and decide where it is in Barcelona you want to live. It’s important to soak up the atmosphere and decide which area suits you (and your budget) the most. Once you have chosen your area, visit as many estate agencies (agencia immobiliaria) as possible, set up several house viewings and weigh up your options. If you are not a confident Spanish speaker, be sure to research some key Spanish phrases or take a dictionary with you on the property viewings. You want to be in an able position to ask important questions, such those regarding deposits or agency fees, without any misunderstandings or confusion. The first thing you’ll need to do is establish residency or non-residency when setting up a bank account. If you are a residence, you just need to take your passport and proof of residence to the bank and you can open an account fairly quickly and easily. If you are a non-residence, you need to obtain a “non-residence certificate”. You can do this yourself with your passport at Dirección General de la Policía. Your chosen bank will also be happy to acquire your “non-residence certificate” for you, although they will most likely charge for this service. With this certificate, and your passport, you should then be able to set up a bank account. In Barcelona, most banks charge for opening an account and maintenance fees. However, there are often reduced rates for those under the age of 26; so if you are eligible for such discounts, make sure you do research on the best deal for you. If you are an EU citizen, then make sure you apply for your European Health Insurance Card (EHIC) before you depart for Barcelona. With this card, healthcare is at least heavily discounted and often even free in Spain. If you become a Spanish citizen, work in Barcelona and pay into social security systems, then you will be entitled to state healthcare. The public national health care system in Spain is considered to be extremely good and efficient. If you are a student, pensioner, unemployed or self-employed coming from within the EU, then you will also be entitled to 2 years’ worth of full and free health care services. Spain also offers excellent private health care, which compliments greatly the state system. So be sure to do your research on this, to decide which health care option will be the best for you. Shield your PIN at cash machines, avoid empty Metro carriages at night and never get in an unlicensed taxi (only use white taxis with a red diagonal stripe across the front doors). The Barcelona metro network is extensive, clean and punctual. It provides a quick and cheap way of travelling around the city. There are RENFE trains which take to you the outskirts of Barcelona as well as various destinations throughout the whole of Spain. If you have more time, then take a scenic bus route. Barcelona has a good bus network, with buses running frequently (and often into the night), transporting you to destinations covering a large area of Barcelona. To use Barcelona's transport cost effectively, it is best to buy T10 tickets, allowing you to travel 10 single journeys for under €10.00 (as opposed to €2.00 if you buy single tickets separately). Want to know more? Read an extended version of this blog. Looking to stay in Barcelona? Use our free Expert Search to find the best place for your needs in Spain! As part of our program to help you when relocating to a new city, we are launching today a relocation guide to Madrid, written by the people who moved and lived there. Brush up on your everyday Spanish phrases – although many people in Madrid can speak English, it’s not guaranteed! It’s a good idea to arrange short-term accommodation in advance for your first few weeks in Madrid. This way you’ll have lots of time to look around for more long-term housing, ensuring that you’re really happy with your chosen place to live. Give yourself time to look around and decide where it is in Madrid you want to live. It’s important to soak up the atmosphere and decide which area suits you (and your budget) the most. If you are a non-residence, you need to obtain a “non-residence certificate”. You can do this yourself with your passport at Dirección General de la Policía. Your chosen bank will also be happy to acquire your “non residence certificate” for you, although they will most likely charge for this service. With this certificate, and your passport, you should then be able to set up a bank account. In Madrid, most banks charge for opening an account and maintenance fees. However, there are often reduced rates for those under the age of 26; so if you are eligible for such discounts, make sure you do research on the best deal for you. If you are an EU citizen, then make sure you apply for your European Health Insurance Card (EHIC) before you depart for Madrid. With this card, healthcare is at least heavily discounted and often even free in Spain. If you become a Spanish citizen, work in Madrid and pay into social security systems, then you will be entitled to state healthcare. The public national health care system in Spain is considered to be extremely good and efficient. The Madrid metro network is one of the largest in the world and provides a quick and cheap way of getting around the Spanish capital. Reliable and comfortable Cercanías trains are a great way of travelling to the outskirts of Madrid. With a wide range of stations in a variety of locations, this form of transport is the best way to get around Greater Madrid. If you have more time, then take a more scenic bus route. Madrid has an extensive bus network, with buses running frequently and transporting you to destinations covering a large area of Madrid. There are night buses (buhos) which continue to run after the Metro has closed. There are also weekend buses (Metrobuho) which follow the same route as the Metro. You can find maps, information and buy tickets for both the Metro and the bus in the ticket hall of every Metro station. Madrid is a lovely city, and if you're looking for a place to stay we can help you with our Expert Search service! Just give us a few details on your trip, and we'll give you options -- all for free. 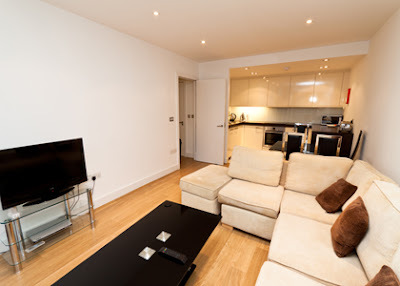 We keep on hearing from both guests and hosts how much they loved their renting experience through Flat-Club. In order to ensure that you have an equally enjoyable time, we've decided to compile a list of other hosts' top tips on the best way to prepare your home for a guest. Whether hosting or being hosted, it is clear that a warm welcome and a comfortable environment are the key factors to renting success. That is why we want to share with you, from a first-hand point of view, the most effective steps you can take to make your guest feel at home and for both of you to get the most out of this exciting and unique experience. And don't forget, through becoming a host you could make a substantial amount of extra money! Arrange your home. It would be great if you could leave some surfaces bare and some cupboards, drawers and/or wardrobe empty for your guest. This will allow them to tidy away some of their own things, making them feel more comfortable in your home as well as ensuring that their belongings don’t get in your way. If you have personal possessions that you don’t want your guests to touch, make sure you let them know in advance. It is also crucial that you leave your place clean and tidy, as this will encourage your guest to do the same on their departure; a win-win situation! Leave instructions. It’s a good idea to provide your guest with information on how to use certain amenities in your flat. This will not only improve your guest’s experience in your home but it will also give you peace of mind that all will go smoothly in your absence. In particular, you might want to leave instructions for WIFI access, the T.V./DVD player, the telephone and the washer/dryer. You may also want to remind your guest to ensure that they turn off the heating/air-conditioning when leaving your house; both your bills and the environment will thank you and your guest! Provide a comfortable bed and clean, crisp linens. Ensuring that your guest is given a good quality bed will not only make them feel welcome in your home but will also allow them to gain a peaceful night’s sleep, undoubtedly improving their overall holiday experience. Providing clean towels for your guest is also a good idea. Leave some books, DVDs or magazines. Regardless of the time of year or the location of your home, we’re sure that your guest will really appreciate being able to enjoy these items. A book is the perfect accompaniment to a drink in the sun, whilst films are a great way to spend a cosy evening in. If you will be sharing your flat with your guest, books or films are also a great common topic of conversation, helping you to get to know each other better. Fill the fridge. Providing your guest with a few necessities would be a lovely welcome to your guest on the first night. Milk, bread, fruit and other possible basic foods would allow your guest to settle quickly into your home. Ready to make the most out of your home? Post your flat on Flat-Club today! In order to attract the maximum number of guests to your posting, it's important to also join a club. Alternatively, if you already have some tips on how you like to welcome your guest, email us at hosts@flat-club.com and we'll add them to the list! 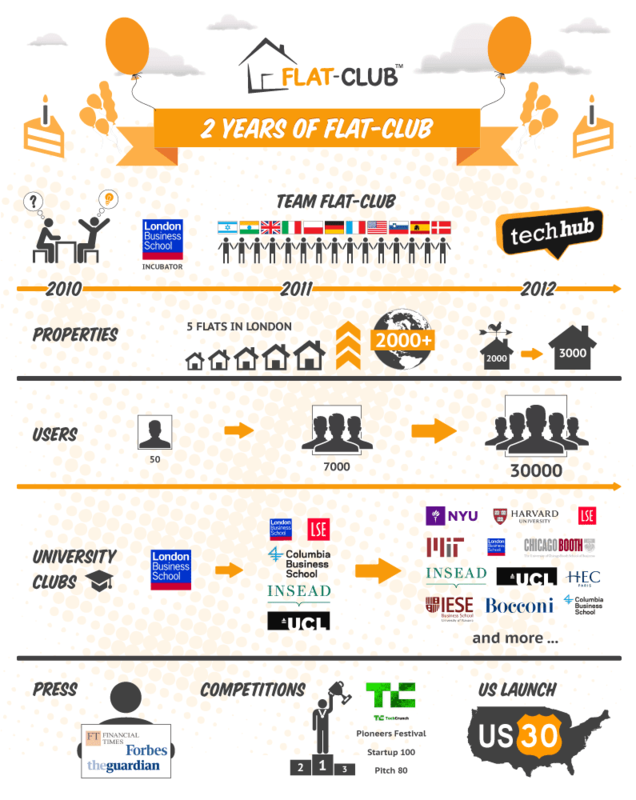 Flat-Club Joins TechHub And Google Campus! We, at Flat-Club, have recently moved out of our London Business School (LBS) office base and into TechHub, an innovative co-working space incorporated into Google Campus. This relocation is not only extremely exciting for us at Flat-Club but it is also testament to how far we have grown and developed as a company over the past 12 months. Being a part of the LBS Incubator Programme has been invaluable for us. We have had continuous access to office space and resources from LBS, which has been crucial for helping us to progress as a company. From the start, we gained a support base of LBS students and alumni, giving us a sense of direction and allowing us to network, collaborate and learn in an entrepreneurial environment. Being incorporated into the LBS Incubator Programme meant that we could also build a positive reputation quickly. As a result, Flat-Club has managed to expand rapidly and successfully. Over the past year at LBS, the team has grown from 2 to 15 whilst the number of flats on our site has soared from 5 in London to more than 2,000 in over 20 major cities worldwide. We have also succeeded in attracting important media attention, for example with The Guardian , Forbes and The Financial Times as well as managing to secure Series A Funding from Venture Capital and private investors. Furthermore, we won the TechCrunch One-Sentence Pitching Challenge , we were selected as a finalist in The Pitch80 UK Best Small Business Competition and we were also chosen as one of the top 100 start-up companies in the UK. One of our most recent blog posts represents the largest database of European start-up competitions and has subsequently received a lot of encouraging reviews from entrepreneurs - you can read it here . As our CEO Nitzan Yudan has explained, “Flat-Club would never grow so quickly without the support of LBS community. From the initial business plan to raising finance – we get excellent advice from faculty. The alumni network and especially the Active Startup Forum on portal are a great source of inspiration as well as support in bootstrapping administration and technical challenges”. It is clear, therefore, that we have a lot to thank LBS for. Whilst we remain very firmly within the parameters of the LBS Incubator Programme, we have now grown so much as a company that we are branching into more networks and facing fresh challenges. This is why we have made the exciting move into the TechHub office, which is a part of Google Campus. The entrepreneurship community at TechHub allows us to share advice and ideas with other like-minded small businesses, offering more inspiration and inciting more energy among us on a daily basis. In this new innovative space we can collaborate with other inspiring people and expand our network even further, creating the perfect environment for Flat-Club to continue to grow in a positive direction. We are hard workers at Flat-Club. But, we can also play hard. TechHub appreciates this and therefore provides its community with a bit of time for socializing on the side. There is a ping pong table to encourage a bit of healthy colleague-to-colleague competition during lunchtime. There are also several opportunities for the start-up teams to get to know each other in the communal kitchen or over a pizza and beer after work. As you can see, we are very excited about our relocation. Flat-Club has progressed quickly over the past 18 months. From a kitchen as an office at its initial beginnings, to the LBS Incubator space and now to TechHub, we are continuing to move in the right direction. We can’t wait to get stuck into new challenges and progress even further in our innovative and inspiring new home. If you're relocating soon, we can help with that! Our Expert Search is a free service that helps you to find your perfect accommodation. Or search for yourself on our site and get in touch with one of our great hosts. As part of our program to help you when relocating to a new city, we are launching today a relocation guide to Berlin, written by the people who moved and lived there. If you are a citizen of the EU/EEA, you do not need a Visa to enter Germany for a stay that’s less than 90 days. Your passport, lease agreement and local registration will suffice for an extended stay. Before you leave home, it is a good idea to arrange for short-term accommodation in Berlin, to give you somewhere to stay whilst you search for more permanent housing. Take a bit of cash in the local currency with you to cover your initial expenses until your bank account is set up. Take time to become familiar with different areas so that you can make the best choice possible on where to live. In most instances, you will need to provide a deposit equal to 1 or 2 month’s rent when you settle on a lease.This deposit is refundable, minus any damages, upon your departure. The average cost of rent for a 1 bedroom apartment in Berlin is €495 a month, with utilities averaging about €135 a month. Most major German banks have branches located in Berlin. You must be a resident, student or a citizen of the EU/EEA to legally open a bank while staying in Berlin. Health care system features a legal mandate for all citizens to possess either government sponsored or private health insurance. If you intend to work or maintain a resident status in Berlin, you are legally required to enroll in health insurance coverage. You can choose to use health insurance you already possess from home; however you will have to investigate whether or not your personal coverage meets German guidelines. 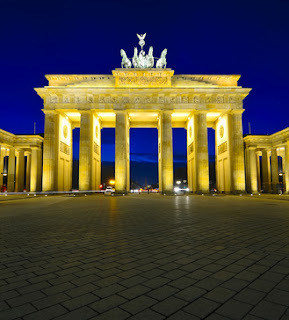 Health care benefits associated with the European Health Insurance Card are valid in Berlin. Always keep your cell phone handy and on your person when you are away from home. Berlin’s Public Transport Authority (BVG) issues a standard ticket for all of its transportation options. Additionally, most public employees speak English, which can be helpful when traveling about the city. A standard fare of €2.30 will grant you access to the U-Bahn, the S-Bahn, and/or metro bus. Taxis are another convenient mode of transportation in Berlin. Most taxi drivers speak English as well. Standard taxi rates begin between € 3.00 and € 3.50. Cycling is also a popular and fun way to get around Berlin. Many residents opt for this particular mode of transportation and there are many bike paths that wind their way through Berlin. You can rent a bicycle for as little as €7.50 a day.